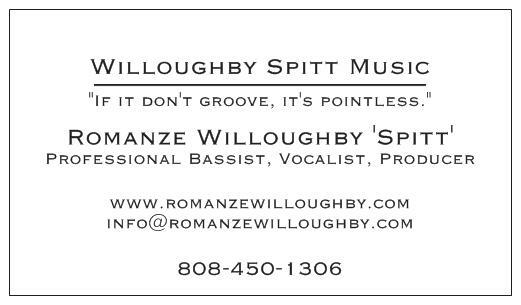 Welcome to the Official Webpage of Romanze Willoughby Spitt. Please feel free to look around & check out my musical resume as well as my bass playing videos, audio & personal photos in the media section of my webpage. In addition to being available for live, touring and studio gigs, I also teach private Electric Bass lessons as well as host electric bass guitar master classes and rhythm section ( bass, drums, guitar or keys ) clinics. Respect, Peace & Blessings 2U & Yours. Jah Bless & One Love.